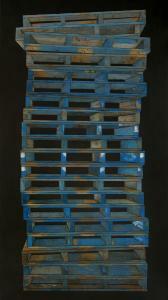 Michael Zelehoski’s mixed media “Blue Pallets’’ at the Tufts University Art Gallery. Boston has great art schools. But, the complaint goes, once sprung from graduate schools with degree in hand, the artists flee for cities with more opportunity. “New and Recent Work by 13 Massachusetts Cultural Council 2010 Award Recipients in Painting and Drawing’’ at the Tufts University Art Gallery attests to the fine stock of artists remaining. The exhibit meanders, but the work is consistently good. The show demonstrates how far afield the definitions of drawing and painting can go, and how the lines between them can blur. Michael Zelehoski doesn’t simply paint: He deconstructs three-dimensional objects and reassembles them onto the two-dimensional picture plane, an astonishing feat of jigsaw puzzling. His “Blue Pallets’’ may look like a painting from a distance, but up close you see how he has affixed flat pieces of used pallets into the illusion of what they once were. Likewise, Yanick Lapuh builds wood reliefs that appear more three-dimensional than they are, thanks to the clever use of paint and joinery. Lapuh applies the controlled precision of his artistry to a manic imagination. His cheeky “I Love You’’ depicts a leering devil waving fistfuls of daisies and crowded by fluttering doves. Matthew Rich constructs his abstract paintings out of cut paper and linen tape. His works, homely but lovingly crafted, defy the assumption that a painting is a pristine, unassailable object. Among the more traditional painters, Harold Reddicliffe culls abstraction from exacting realism. His “Objects From Overhead’’ turns shadows and cables into a formal composition of shapes and lines. In Joshua Meyer’s quivering portraits, reality appears to collapse in a flurry of light, color, and brush strokes. Christopher Faust applies contemporary neuroses to 19th-century ideals of romanticism in his fraught depictions of figures in landscapes. Monica Nydam takes a less ironic approach in her paintings of horses, made after she advertised on Craigslist for images of things people loved. Someone sent her 45 pictures of a horse named Minnie, and Nydam painted as if she herself loved Minnie. The untitled works captivate because they are as much about image making as sentiment: Each is broken into symmetric halves, with shadows often pixilated, and the horse deliciously blurred in motion. Of the painters, only Masako Kamiya’s work tripped me up. It’s irresistible eye candy - Kamiya builds hundreds of stalks of color out of dots of gouache, creating a touch-me texture. But I’ve followed Kamiya for years. Her work hasn’t appreciably changed, and unlike with, say, the work of Reddicliffe - another longtime Boston artist - her paintings begin to seem like the same old thing. In the drawing category, Cree Bruins links together old ID tags from strips of 35mm film in light boxes for the installation “Tagline.’’ The result is an intimate little abstraction, filled with meandering trails of light and translucent puddles of darkness. The line of those trails qualifies these pieces as drawings. Jan Johnson draws with stitching and loose thread on old handkerchiefs, in biomorphic works that are homey but messy and occasionally unseemly - how like home. Daniel Ranalli offers photographs of found drawings, such as the traces snails make in the sand, which inadvertently end up as abstract drawings that also suggest narratives of community and individualism. In the first panel of his black-and-white diptych “Snail Drawing: Triangle With Shell,’’ Ranalli has arrayed the little mollusks around a clamshell. In the second, time has passed and the snails have created paths, some straying far, others rushing the shell. Cristi Rinklin’s drawings are all about painting, stuffed with lyric references to art history and digital technology in gesture and the use of space. She usually works big, and it’s a delight to see her muscular rivers of color on a more intimate scale. Evelyn Rydz uses the most traditional technique, drawing clots of beach flotsam with colored pencils on drafting film. Her exquisite attention to detail pulls the viewer in as if the pile of trash were a bouquet of flowers. Cuban printmaker Isolína Límonta specializes in collagraphs - prints made with plates that have collaged materials on them. Her show at Galeria Cubana is lush and dreamy in hue and texture, and even her drawings are built upon layers of imagery and pattern. The layering suggests subtexts of longing and levels of consciousness and identity in the figures she portrays. The collagraph “Alfonsina y el mar (Alfonsina and the sea)’’ is soaked with hot hues. A neon-orange figure in a flaring, elaborate up-do has a powder-blue face streaked and patterned with green and orange tendrils. She faces another figure, this one upside-down in a purple-green mosaic, with a floral pattern rising up her torso. More plant life fills the ground between them. A heart floats between the two women. Some of the works can veer too deeply into yearning - this is a theme that crops up often in Cuban art, and may reflect the sometimes difficult life of an artist in an isolated island nation. But when the color kicks in, the works rivet the eye.